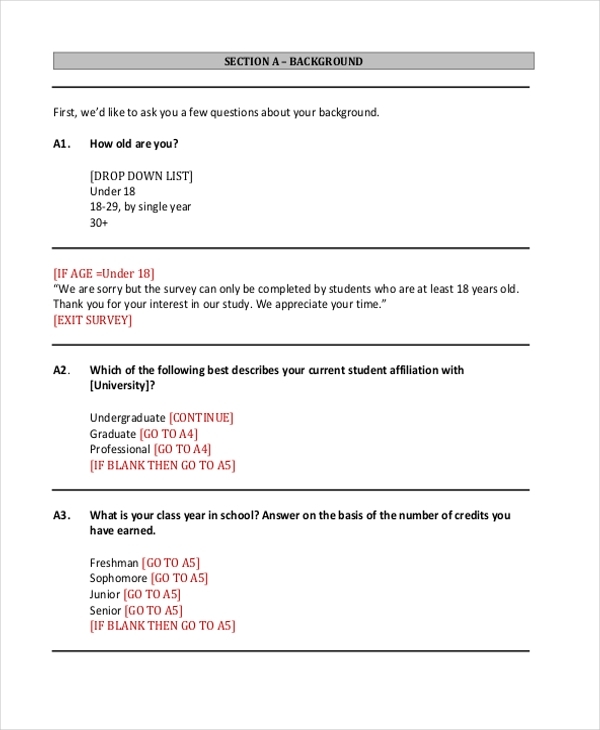 Whenever a company or an individual sets out to do a survey or statistical study of some sort, they usually resort to developing a questionnaire which has a list of questions relevant to the topic the survey is based on, and the same is distributed or handed out to target participants. Questionnaires are diverse in their content because they are so topical. Topics are diverse so their questionnaires will be developed accordingly. Let’s check out the types of questionnaires that exist and are very popular. A health questionnaire could be developed in a variety of ways. It could be generic or it could also be specific to a certain target audience. Questionnaires on health-related subjects are generally created and used by health outlets, agencies, hospitals, clinics, institutes, medical colleges etc. A medical questionnaire form is not similar to a health questionnaire form. Usually, medical questionnaires are used by hospitals and clinics to give it to certain patients to fill so as to gauge patients’ medical health details better. Also, doctors fill such questionnaires on their own when examining a patient. 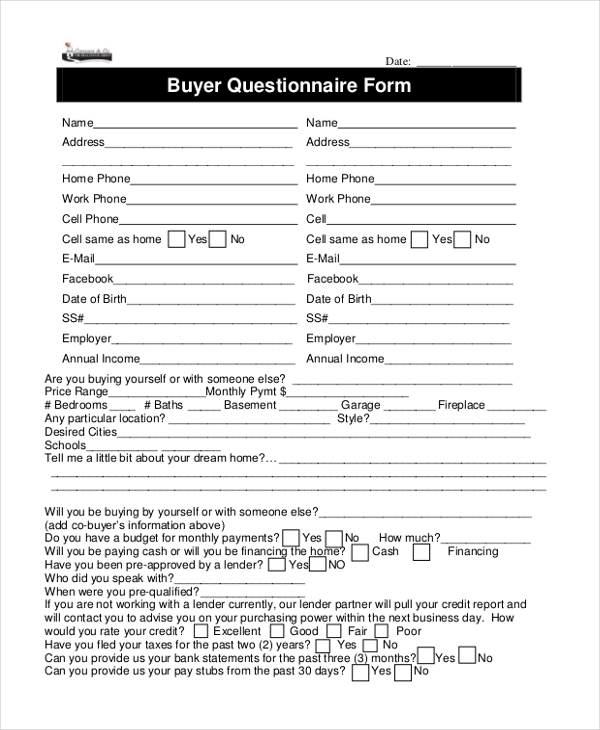 A buyer questionnaire form generally surfaces when a potential buyer is showing interest (or has confirmed) in buying a particular asset or property as a home, vehicle, services of some kind etc. The form contains a list of questions which need to be answered so that a company can gauge the buyer’s mentality and motive behind making a purchase. 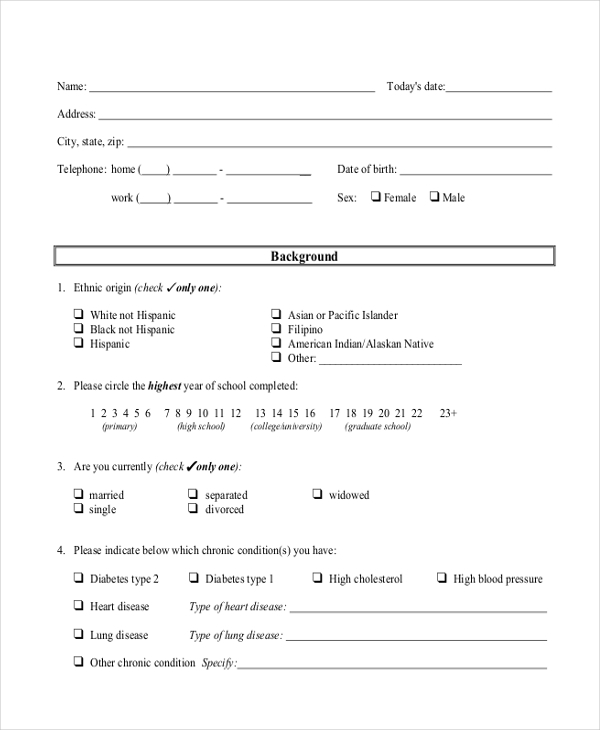 If a patient with a special disability wishes to apply for assistance services, then authorities will hand out a disability questionnaire to them which they must populate with accurate answers pertaining to the condition of disability and other relative factors. 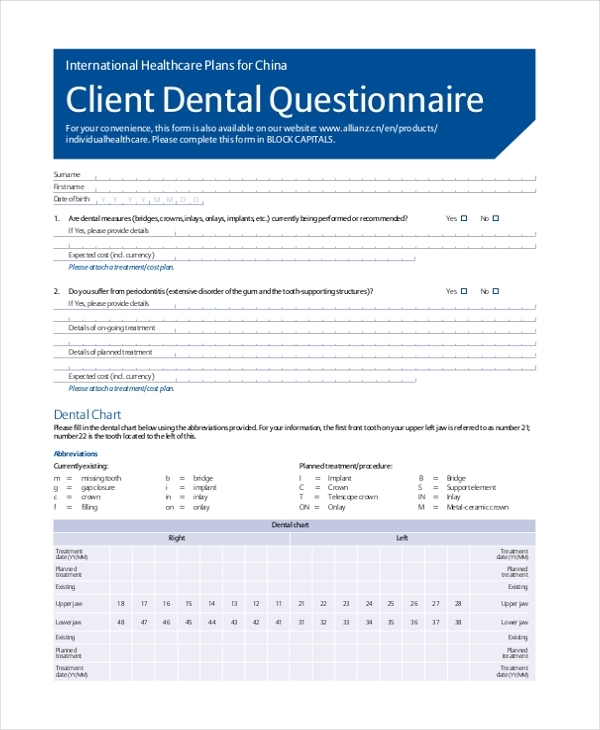 A dental questionnaire form is usually used by dental clinics to give it to their first-time patients. The form has questions in which a new patient must furnish details about their existing oral health. The answers in the form prove beneficial for the dentist at the time of assessing a patient’s dental wellness or lack of it. 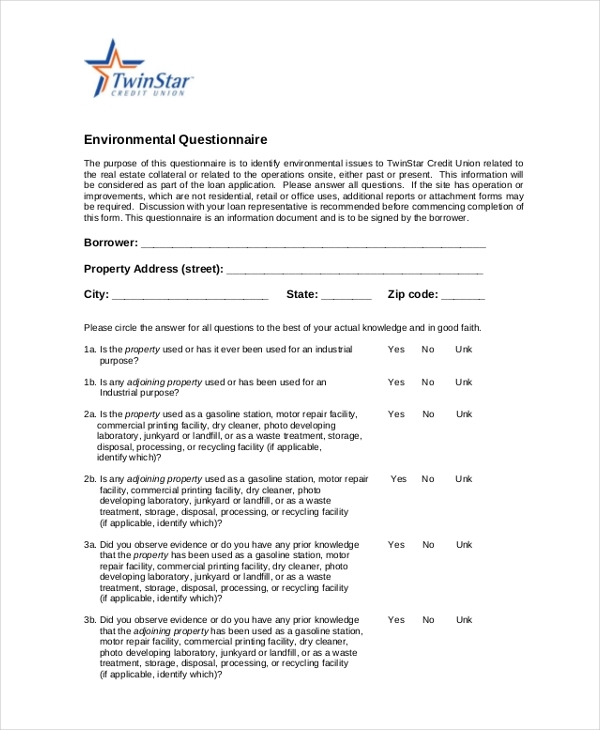 Not just authorities associated to environmental outlets and organizations, many other companies also proactively have customers fill up environmental questionnaires to know whether or not, how their products and services could be influencing the environment. 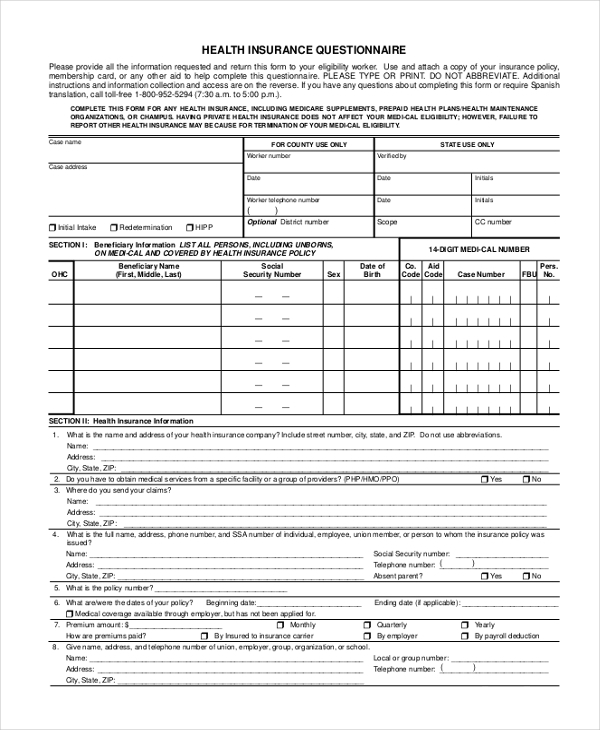 This kind of forms is not just used by organizations involved in environmental policing but also others such as real estate, beauty, and cosmetics etc. Financial questionnaire forms are used by financial bodies such as banks and insurance companies. 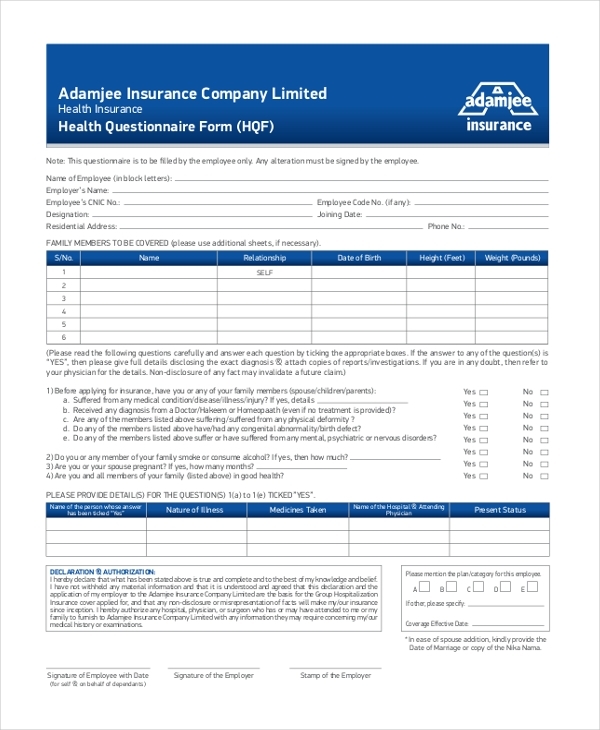 These questionnaires are designed to be filled by potential customers at the time of applying for a bank loan or insurance cover. 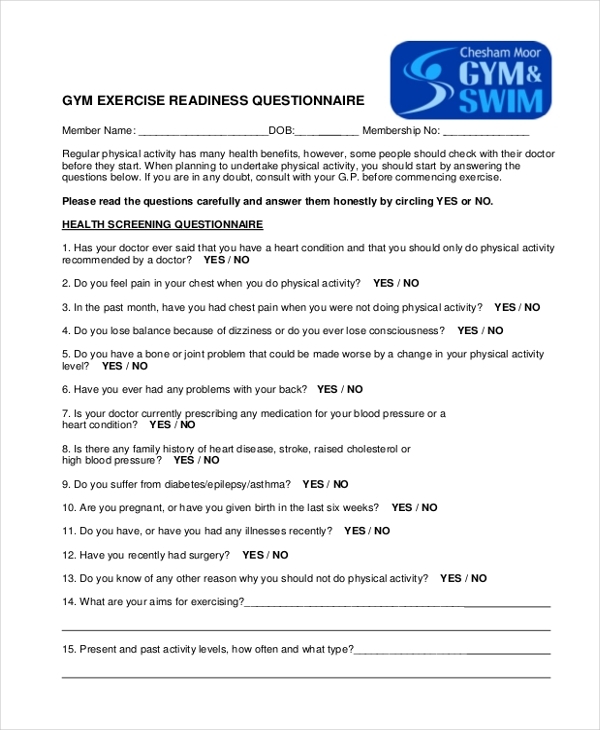 Prior to kicking off a gym schedule with a new joiner, gym authorities request their new members to fill up a gym questionnaire form which needs to be answered in YES or NO. The responses would be used to determine which kind of workout regime would be suitable for the new member. 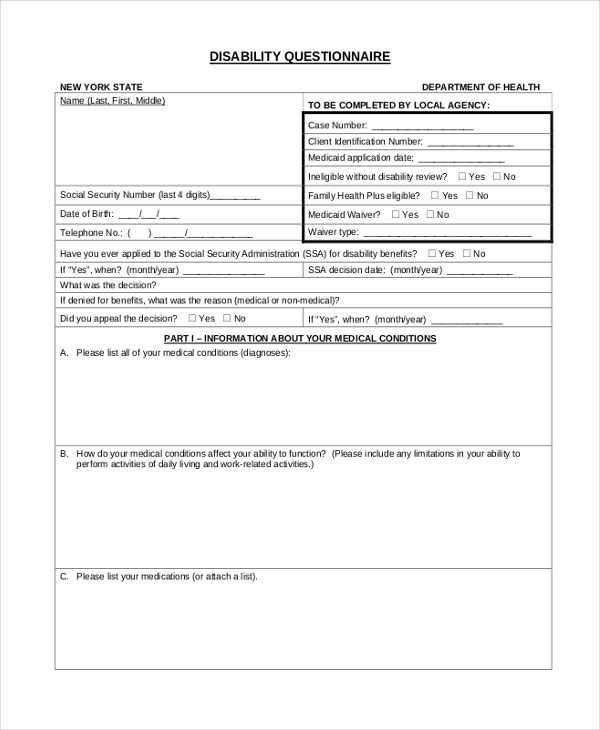 Health insurance questionnaire forms are useful when new potential customers approach health insurance outlets to apply for a health insurance policy. 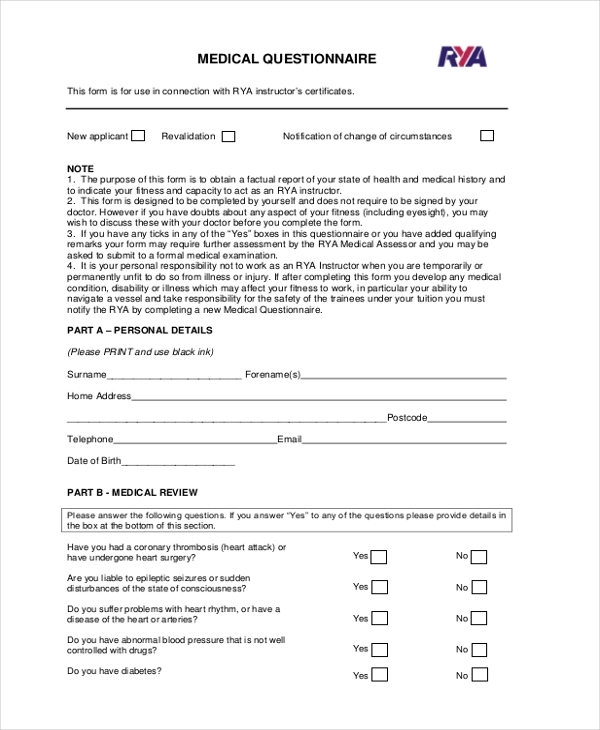 The questionnaire is lined with different questionnaire pertaining to the existing health history of the applicant and the kind of health cover they would like. 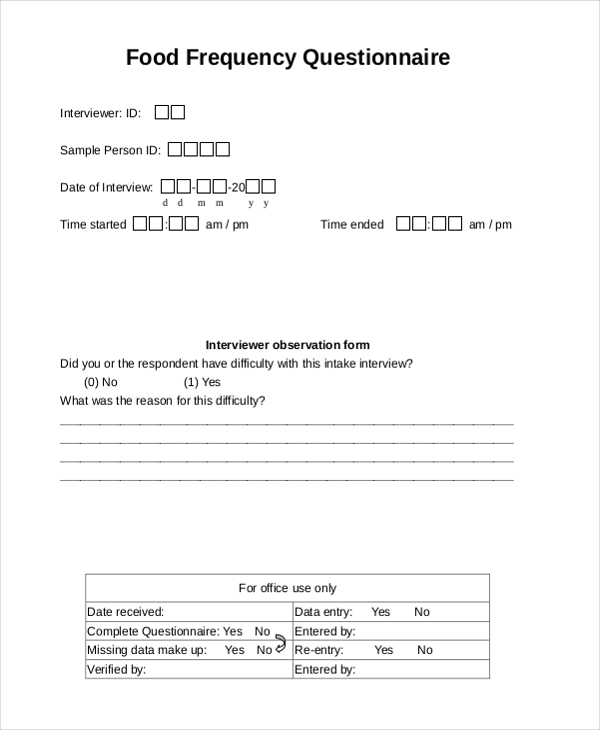 An interview questionnaire form is handed out to potential candidates to fill before or after the interview is scheduled. The questioned are ideally choice-based and the selection of answers proves instrumental in providing the interview or recruiter more important information about the candidate. After the completion of a session of therapy or an entire treatment cycle, doctors, specialists, hospital and clinic management often give out patient satisfaction forms to their outgoing patients in order to get their feedback on the treatment and other services which they received. 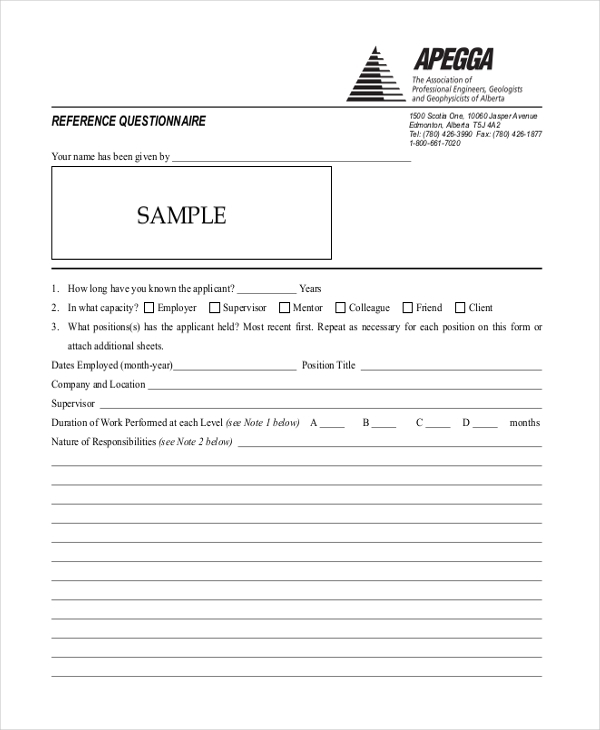 A residence questionnaire form is used by universities to give it to students to fill who have applied requests for accommodation on campus. If a housing authority wants to conduct a survey of rental the rental properties within a particular area or in a particular building. 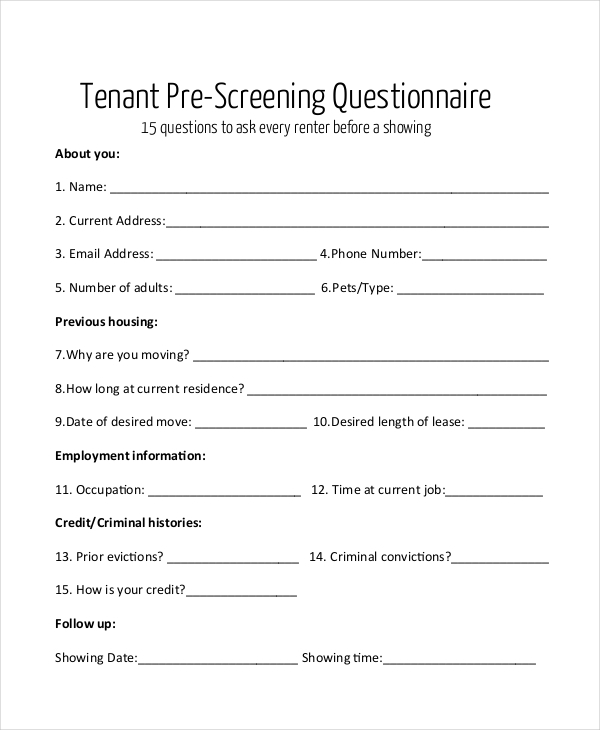 They usually fill up rental questionnaire forms as they make rounds talking to the occupants of the shops, outlets, flats, and apartments. 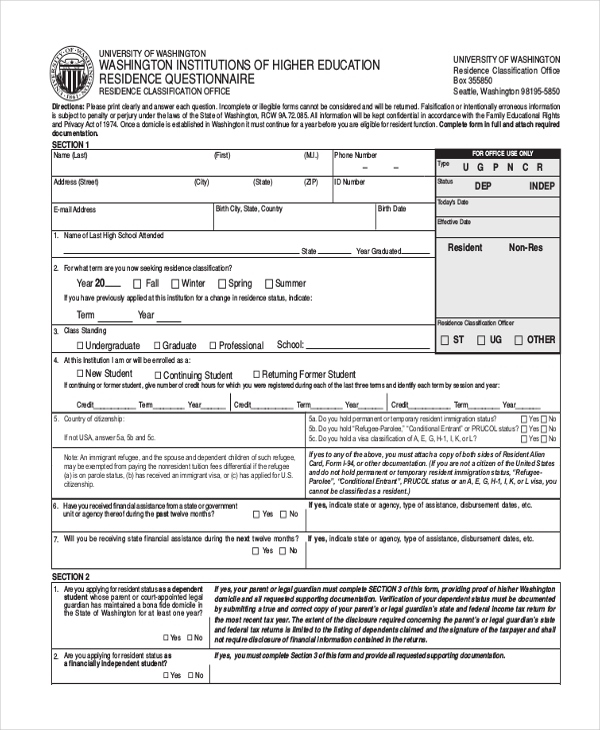 If an applicant has applied for employment or tenancy using a second or third-party reference, the said referee needs to fill up a reference questionnaire form indicating and verifying their association with the said applicant. A sample questionnaire form can be versatile. It can be prepared to be any topic like health, medical, academic, personal, financial etc. 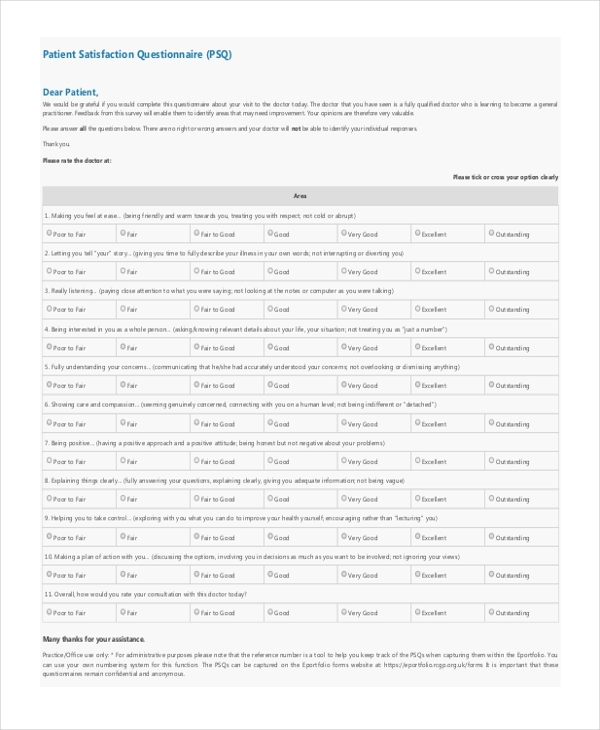 The contents in the form have to either be ticked, ranked, rated or answered elaborately. 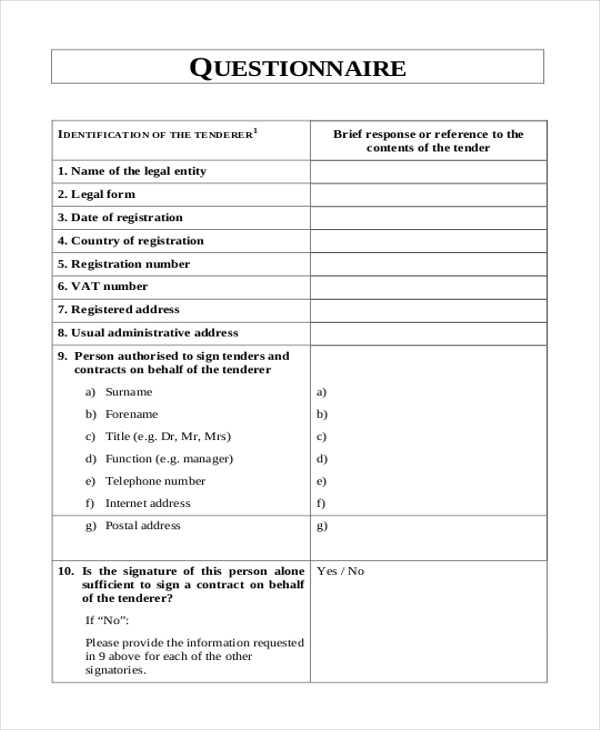 A questionnaire consent form is used in matters where research and case studies are being performed. Subjects are briefed about the topic of study and how their responses will be used for the same. All responses are kept confidential and consent of subjects is duly sought before they proceed to fill the questionnaire. A questionnaire checklist form contains checklist questionnaire which need be answered with accurate information. Such forms are routinely used in corporate organizations where tender calls from other companies are being sought. The applying companies need to populate the checklist questionnaire and submit. 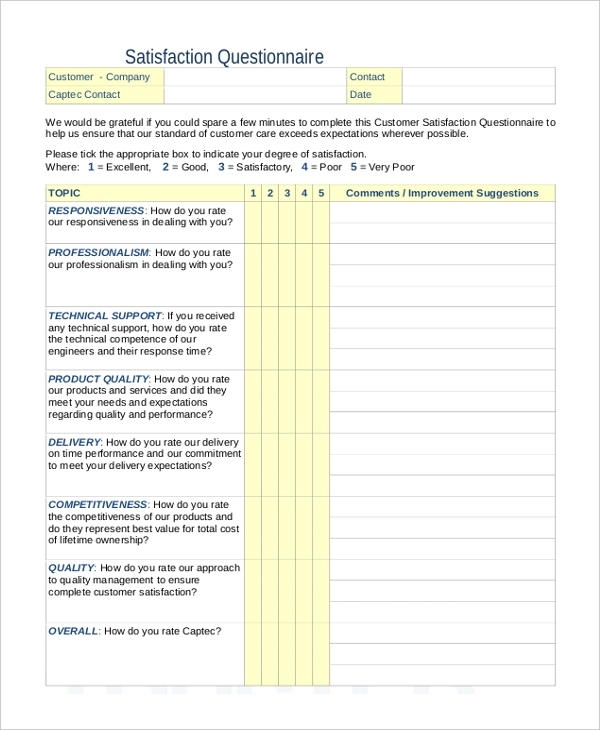 A survey questionnaire form can be designed and formulated in a number of ways. It all depends on the topic on which the survey questionnaire is based on. Depending on the topic the questions are prepared. They could be choice-based on open-ended. The answers could be used for research, opinion poll etc. 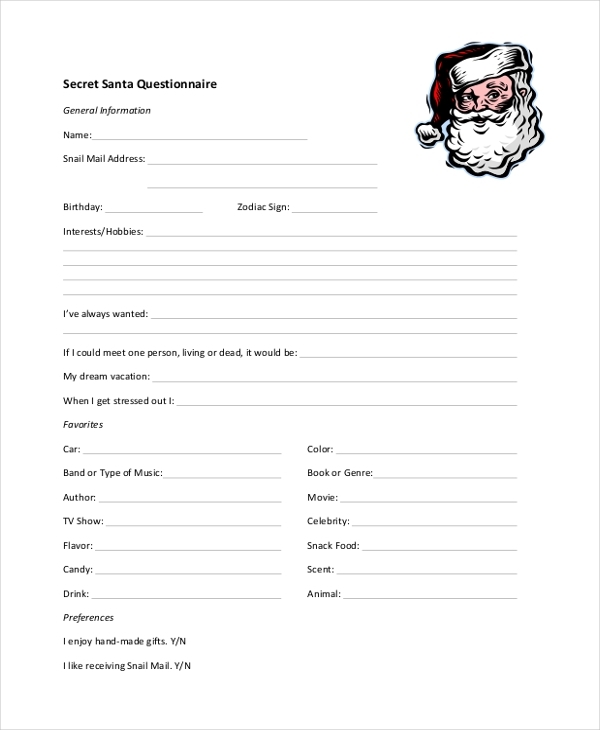 Before the onset of Christmas season, Secret Santa questionnaires are designed and distributed among office personnel or classroom students. The idea is to ask questions that help respondents what they would like to receive as a gift from Secret Santa. A satisfaction questionnaire is by and large a versatile form which can be drafted on a host of issues and topics. It could be targeted at company’s employees, students of a certain age, patients suffering or recovering from a particular ailment in a hospital or clinic, consumer of a brand or a particular product. The crux of satisfaction forms is to ask questions that help in studying the levels of satisfaction in a group of people. Food companies and health outlets often use food frequency questionnaire forms to understand the eating habits of a targeted demographic or a general set of respondents. The responses in the forms are used by health and food outlets for research as well as improving the standards of products in the market. A training questionnaire form is useful in training programmes – prior, post or while it is in progress. The training questionnaire form distributed amongst the participants to learn more about their experiences and opinions on the training programme which they attended or they are going to attend. Prior to developing a questionnaire form, the important question which needs to be deliberated upon and addressed is: who is the target audience? One needs to formulate the contents of a questionnaire keeping in mind the facets of the respondents that are likely to participate and answer this questionnaire. The consumers of a particular brand, users of a certain service, employees of a company etc. If you’re well-aware and confident about the target audience, it is going to be very easy to come up with questions and choices for each one of them. The primary purpose of any time questionnaire is to gather feedback, opinion, learn thought processes of respondents with regards to a particular subject. 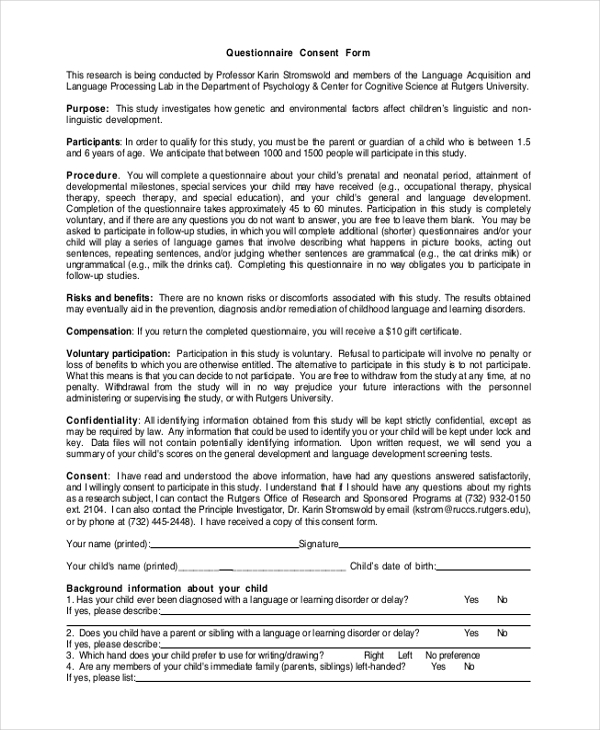 Questionnaire forms are crucial for any research exercise. Therefore developing and using a questionnaire form in the right manner for the right purpose is extremely important and very critical. 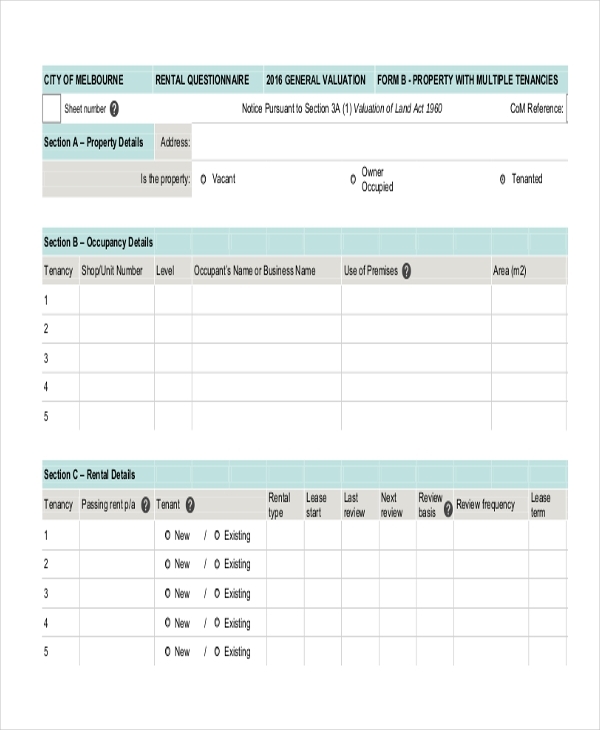 Questionnaire forms are largely popular because they are practical, and they possess a large amount of information in the most cost-effective way possible. 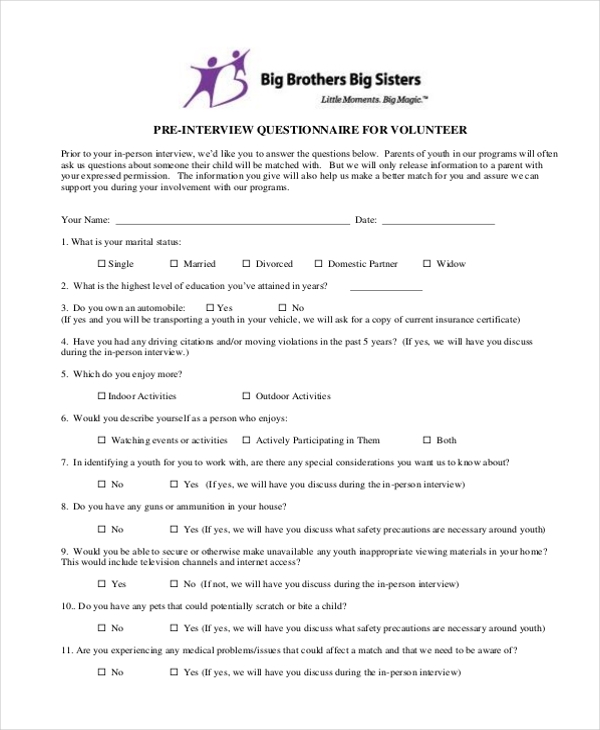 The bigger plus is that questionnaire forms help in reaching out to a wider audience base in so much less time. Also, the results can be quantified using a reliable app or software. The data present in questionnaire forms can be put forth for scientific analysis, and it can be easily compared and contrasted. There is no doubt that questionnaire forms are immensely popular. Their demand is reflected in their success as a yardstick for judgment and research. With so many industries and topic available, there is never going to be a short supply of questionnaire forms. So long as there are topics worth asking questions about or for, an audience ready to answer, questionnaire forms will remain a part of our lives!